This was a total transformation of a master bathroom in Tempe. In the Before photo you can see a corner of the wall. There was a closet on the other side. On the left side of the picture you can see just part of a typical bath tub and shower combination. The homeowners wanted a walk-in shower and a free-standing tub. By turning the closet space into bathroom space, it opened up the bathroom immensely, and gave a perfect spot for the curb-free walk-in shower. The original shower/tub was turned into a beautiful claw foot tub. Hence what once was simply a functional bathroom now gives the feeling of an elegant spa and a place of relaxation. I would like a quote on a bathtub replacement in a secondary bathroom. It is a bathtub with a shower over so it might also need a new surround. I am looking to get information about what a remodeling job would cost and how you could help. We want to change our kitchen cabinets and counter tops, remodel our master bathroom, possibly add a pool. A 1700 sq ft house built in 1959, in need of updated electric, plumbing, kitchen and bathroom remodel. We Are currently looking to re-model/gut--remove walls, create more space are entire home approximately 1500 Sf. ft. and re-model garage. Looking for an estimate and create ideas. We would like to add on to the back of our house. Potentially expanding the master bedroom, adding a walk in closet, master bathroom, and adding a den/family room to the rear of the house. Need a quote to remodel our 6 x 8 master bathroom. We want to move the shower and toilet, install a fan and solatube, extend the counter top by knocking a small wall down. TraVek Inc is a full-service interior home remodeling company, which means we have all the tools and experience necessary to take a project from design to completion. Our goal is to give each and every one of our customers the finished results that they have always wanted. Over the years we have worked on our process to work with our customers every step of the way so the process will be as easy and convenient as possible. It is also important to us to always grow with the industry, so we are always training our employees on the latest techniques. As a family owned and operated company, customer satisfaction and relationship building are extremely valuable to us, and we want you to feel the control you have over your project. If you are considering remodeling your home or adding an addition you’ve come to the right place, don't hesitate to call or click to contact us today! In our opinions, the kitchen is the most important area of a home because it is such a central gathering point. 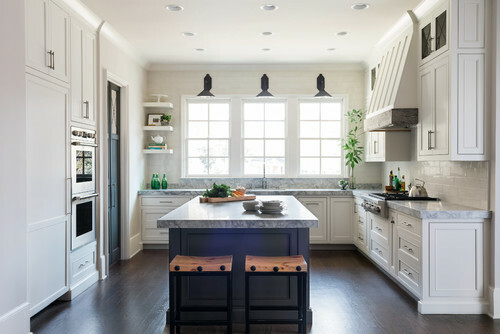 Everyone has to eat and everyone has to use their kitchen and as a result of that, it is common for the kitchen to be the most used room in a home. TraVek Inc offers high quality kitchen remodeling services that are guaranteed to totally transform your living space. Our experts will help you discern which features are most important to you and explore a variety of options for cabinets, countertops, and more. If you are also spending a lot of time in your kitchen, don't hesitate to call us so we can begin planning the kitchen remodel that you have been dreaming about! Bathrooms are also a hugely important part of your home because there is no better way to add value and personal comfort. TraVek Inc also specializes in bathroom remodeling services that range from the simple installation of a sink, to a complete makeover. It is a huge mistake to neglect your home's bathrooms because with so many different finishes and fixtures available a bathroom is one of the most customize-able areas of your entire house. Changing the tub, sink, tiles, fixtures, lights, toilet, or vanity can drastically change the look and feel of your bathroom and we won't stop until you get the exact look you desire! If you're interested in any of bathroom or kitchen remodeling services don't wait - contact us today and get a quote! Get a Bathroom Remodeling Estimate! After focusing on remodeling for many years we decided to branch out and incorporate more building services because we would commonly work with people who enjoyed their homes but wished they had a little more space. We can add extra space to your home while following the exact specifications that you require which will give you and your family the extra space that you deserve. Building an addition onto your home is a great way to add more space, and get the home of your dreams, without the cost and hassle of moving. Here at TraVek Inc, we can design and build a custom home addition or guest house to fit your style and needs! Get a Kitchen Remodeling Estimate! The spot where the curb-free walk-in shower stands right now was once a closet. The shower/tub combination has been removed and replaced with an elegant claw-foot tub. Remodel a kitchen with new cabinets, floors, lighting, tile and paint. Remodel a linen closet, flooring in the hallway. Remodel a bathroom. I need an estimate for a master bathroom remodel at my house. Need bedroom and bathroom remodeled as a priority, but need the bathroom upstairs, kitchen, living room remodeled too! Replacing kitchen counter, bathrooms fixtures, bedrooms carpet. Estimate for a kitchen remodel, updated flooring and vanity in bathroom. Wanting to do a kitchen remodel. We are the original homeowners (28 years). We replaced the countertops about 12 years ago, but now its time to do a complete remodel of our kitchen. Thank you!